A free rewards program pilot launched in the Dallas-Fort Worth market last April by Target appears to have been successful as the chain announced this week that it is rolling it out to guests (AKA customers) in Charlotte, Denver, Indianapolis, Kansas City and Phoenix on Feb. 19. According to the retailer, hundreds of thousands of people have signed up for the program in North Texas and millions of dollars in transactions have been processed. 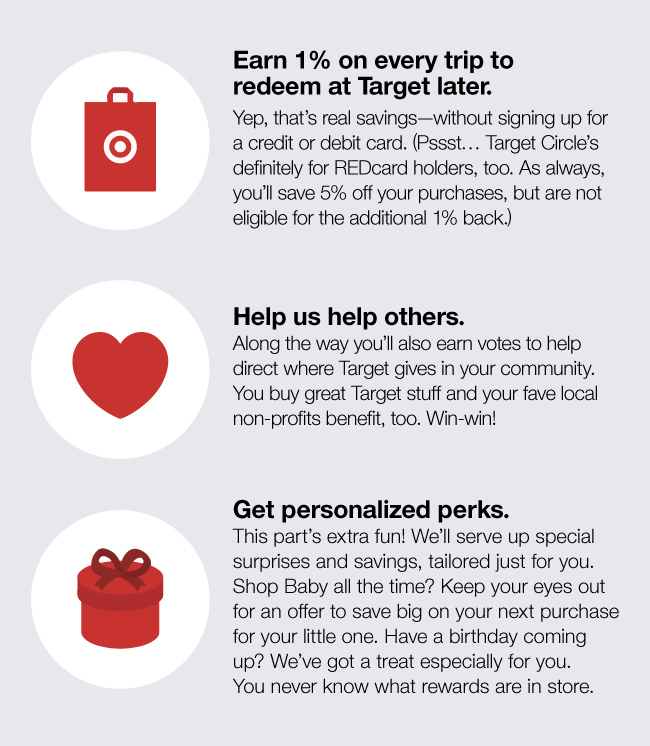 The program, Target Circle, offers members one percent back on purchases that can be redeemed at a later visit as well as free next-day delivery on everyday staples with Restock. Customers can get half-off a first-year membership with Shipt’s same-day delivery service. The program also gives members a vote in deciding which local organizations Target supports. Around $250,000 has been donated in D-FW since the initial test began. “We’re building deeper relationships with guests and serving up the most personalized way to shop Target yet, all while encouraging everyone to choose Target again and again,” said Mr. Gomez. Target expands its rewards program coming off a strong 2018 holiday season in which it posted a same-store sales gain of 5.7 percent, on top of a 3.4 percent gain in 2017. DISCUSSION QUESTIONS: Where do you see the greatest potential for Target to benefit from its Circle rewards program? Do you see any potential pitfalls? "Thoughtfully designed, it reflects what Target knows makes it unique and loved by guests that truly love them and honors that." "Being a huge fan of Target, both personally and professionally, I would rather see more sales associates on the floor than a 1 percent perk." "Hey Target, try getting the basics of retail management right before going down the path of another loyalty program." 9 Comments on "Will a new rewards program expand Target’s circle of guests?" Target has continued to do many things right and no doubt it’s paying off which is why they have been successful. There are many rewards programs out there, and customers have become numb to many offers because they tend to be the same. However, providing an opportunity to earn 1 percent on every trip for redemption is wise and should be an incentive for consumers to participate in the program. Too many retailers require customers to get their credit card to receive rewards, and at a time when consumers are trying to cut down on credit and get away from the 29 percent interest credit cards, Target is wise to provide an incentive that is unrelated to having to obtain another credit card. I see Target Circle as a win for Target, and they should be successful. The pitfall may be in believing their own hype (sorry Mr. Gomez). Target gave up its cheap chic cachet a long time ago in favor of reduced assortments, empty shelves, and prices higher than Walmart. The last thing anyone is looking for these days is a new reward program. The current program probably isn’t that great, otherwise it would have been expanded chain-wide rather than to a few selected cities. Loyalty program isn’t the right word for Target Circle in my opinion, nothing about the design reminds me of the price deduction/rat-in-a-maze style of program we’re used to seeing. From the way it is presented and its inaugural features, Target Circle is about partnering with Target’s guests. Thoughtfully designed, it reflects what Target knows makes it unique and loved by guests that truly love them and honors that – along with taking some of the “best of” from Amazon and Shipt. I’m excited to see how the program continues to evolve. Watch this Red Circle program from Target very closely. It offers free delivery perks (albeit on a limited number of SKUs – for now), cash rebates, philanthropic engagement, and personalized offers. Based on the reported results, it appears the program is popular with Target and the DFW shoppers. This model feels to me like it has the potential to actually rival Prime in some ways. It is driving repeat purchases, encouraging engagement, and delivering rich data to the retailer. If Target really takes full advantage of that data, this program could have huge potential. I know I will be watching closely to see how it evolves. I’m missing something. Please, someone tell me why I would want another “loyalty” card and save 1 percent with it, while I have a REDcard that yields me 5 percent. Being a huge fan of Target, both personally and professionally, I would rather see more sales associates on the floor than a 1 percent perk. While Target is laid out simply enough, frequently it is time consuming to find things. Resulting in trying to flag down an associate as they race past, who usually has to pull out a device to figure out where to send me. Aisle C? Ok, Aisle C — product not found. I point this out as it is a frequent scenario when shopping Target. “It’s about discovery, inspiration and an effortlessly joyful shopping experience,” according to Mr. Gomez. Bottom line: effortlessly, joyful has big potential! 1 percent, not so much in a time crunch. Hey Target, try getting the basics of retail management right before going down the path of another loyalty program. In the past month, my wife has endured TWO BOPIS failures and just yesterday spent an hour on the phone with Target’s off-shored support to get a small missing credit. Loyalty programs or technology or anything, are not sufficient cover for poorly executed core shopping experiences. So unless my wife suffered two anomalies and unless Stephen Needel is wrong about reduced assortments, empty shelves, and prices higher than Walmart, they have plenty of work to do ahead of new marketing schemes. A 1% reward for getting customers to provide their contact info, accept direct communication for sales and promotion, and permit tracking/storing their personally identifiable transaction data is a huge bargain for Target. 1% is not enough to have a real impact on changing customer behaviors or creating true loyalty, but this program is a no-brainer in terms of being easy to generate a positive ROI. At the very least, every chain store retailer should have a similar loyalty program, otherwise they are overspending on their marketing and leaving profits on the table! Benefits from a program like Target Circle will only come nationally if Target adapts the program to local demographics. To put the program in perspective, the retailer is providing $1 for every $100 spent. Not sure that is enough incentive to switch even a modestly satisfied customer from a competitor, especially in middle, middle to upper, middle America. Will the Target Circle rewards program prove better at attracting new customers to the chain or driving shopping visits?